In a modern world where we are all concerned about having more energy and looking and feeling great, people have never felt more stressed. We are fast becoming a nation of workaholics with an “all work, no play” culture. However, we can all reduce our stress levels by getting back to basics, by improving our mental well-being which can lead to better health. We all need to take responsibility for our health by promoting the link between mind, body and spirit, and using natural health care that works in synergy with the body. As well as conventional medicine, I think people can revitalise their health by starting on the inside in order to look and feel great on the outside. 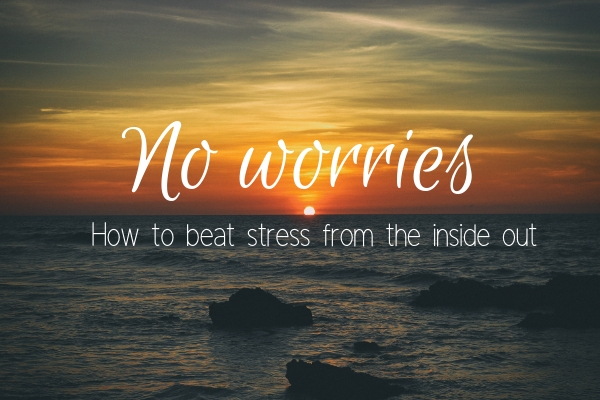 It’s about stripping back to basics as emotional stress can affect our physical health. We have always thought we are born with our genes and there is nothing we can do to change ourselves, but we can. Telomeres are the bits on the end of our chromosomes that keep them intact, like the plastic caps that hold the ends of shoelaces together. As cells divide and replicate, telomeres eventually shorten; when they become too short, cells die. This leads overall to a shortening in the length of our lives. Lots of different factors affect the shortening of the telomeres and Nobel Prize winning research has shown that stress affects the shortening of our telomeres as much as smoking does. Therefore, stress is as bad for your health as smoking. However, the great news is that you can slow telomere shortening and rejuvenate your cells by making relatively simple health and lifestyle changes. We live in hectic times and are always striving for more. It’s helpful for some to keep a ‘gratitude journal’. Every morning write down three things you are grateful for and do the same before bed as you reflect on the day. It can be as simple as enjoying times with a good friend or being happy that the sun has been shining. Remembering the positive things about yourself and your lives has a positive effect on mental well-being and mood. Scientific research has shown that visualising can make a difference to our health. Cancer sufferers who spent time visualising their cancer cells being destroyed had better results than those who didn’t. We often feel helpless in our situations and that can cause stress in our lives. It can be helpful to spend time visualising – or imagining – the life we want. Simply sit comfortably, close your eyes and ‘imagine’ the life you want and the person you want to be. This only takes five minutes a day and can have huge benefits to your health and mood. We all breathe already so surely there can’t be a ‘correct’ way to breathe? Actually, there is. We often breathe unconsciously and without giving it a thought, but it is important to become aware of this. Studies have shown that breathing in a regular rhythm influences the heart and health in general. The best way to breathe is to make the out-breath slightly longer than the in-breath. Any pattern of this is good, but the ideal is four seconds in, and seven seconds out. Practice this for five minutes a day, before bed or during relaxation time. It is also good to use your stomach during breathing. A technique often practiced by Yoga followers is to move the stomach out when breathing in and to flatten it on the out-breath. It may feel a bit odd at first but with a little bit of practice this will soon become routine. Walking for half an hour a day is as effective in treating mild to moderate depression as taking anti-depressants. Exercise releases endorphins, the ‘feel good’ chemicals in the brain and gives you a natural high. Any form of exercise is good, from walking, to tennis or yoga. Tea, coffee and energy drinks should be avoided when stressed. They may be refreshing for someone who’s tired, but they also contain neuro-stimulators like caffeine and theo-bromine, which are proven to heighten stress. Stress makes you anxious – further stimulation can heighten this anxiety and even cause insomnia. Junk food and takeaways are a far cry from a balanced and healthy diet. They contain high levels of protein, fats and carbohydrates that don’t contain vital minerals and vitamins, which can induce stress. Reducing stress is all about a balance of the correct vitamins and minerals, so it’s highly recommended to avoid all fast foods and takeaways. Soft drinks are packed full of calories that are useless and contain no vitamins or minerals. When stressed, a build-up of carbon dioxide and lactates in the body can result in a condition called ‘acidosis’, which is damaging to health. The high levels of carbon dioxide in drinks aggravate stress. Sugar should be avoided where possible – stress causes an increase in blood glucose levels, which can in turn lead to a higher risk of developing diabetes. Reduce stress by eating fresh fruit and vegetables, which provide stress-reducing vitamins and minerals. Vegetables also have a high fibre content, which is helpful in treating constipation – another long-term effect of stress. Fish such as mackerel contain Omega fatty acids, which are extremely good for the heart and can protect you from heart diseases. Fish also contains choline – a great memory booster, which can help you during stressful times. Yogurts provide minerals including calcium, essential to maintain well-functioning nerve impulses and calcium can also be found in leafy green vegetables and avocados. Herbal items such as dandelion, chamomile, and passion flower also relax both the body and mind. More than 100 scientific studies have shown the benefits of meditations, from lowering blood pressure to improving sleep to helping people to give up smoking. It is about trying to quieten our mind and the internal dialogue that goes on most of the time inside our heads. You can learn this at a yoga class or by buying a meditation CD. Or you can give it a go yourself by sitting comfortably with your eyes closed and trying to quieten your mind. A good way to try is to count as high as you can before your thoughts come in and distract you. Most people rarely get above three so don’t feel frustrated. It is normal to have thoughts coming in, it is important to just push these thoughts away and start again and not to get frustrated. When you next brush your teeth, instead of letting your mind wander, spend some time focusing on brushing your teeth, the sensations you feel and the sounds and how it makes you feel. This is called mindfulness. You can try this whenever you are doing anything routine, from washing up to having a shower. Becoming more aware can help distract us from our internal chatter and leave a clearer mind.